R-K-Campf Transport is owned and operated by Rob (R) and Karrin (K) Campf in Salem Ohio where it all began for them in 1993. Starting with a very rough, and not so pretty Kenworth cab-over, Rob and Karrin have built R-K-Campf Transport in to one of the largest flatbed carriers in Ohio. 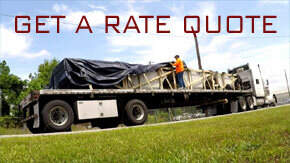 As seen in the images to the right, we utilize the very best equipment available to the trucking industry. This helps to ensure that our drivers have the best in safety upgrades, and our customers can rely on their freight arriving on time. By allying with major national steel carriers, and using honesty and integrity as their main building blocks, R-K-Campf has survived the tough times and flourished in better times. Giving back to their employees has been key to the growth that R-K-Campf Transport has enjoyed. The Owner Operators leased on to R-K-Campf receive top industry level pay rates for the work they do. In most cases they are paid 77% of the gross for the freight they haul, and with some customers we pay up to 85% of the gross! They also have the option of of Medical Insurance. All fuel and road taxes are paid by R-K-Campf, period. All interested drivers have the option to sign up for dedicated runs to help guarantee where they will be each week and how much they will make. If you are interested in working for R-K-Campf, visit our jobs page for the most recent information on our hiring status. We specialize in flatbed freight transportation with pickup and delivery locations east of the Mississippi river, but we will consider freight going further west.